Ethiopian food is a treat for us locally. Although Seattle based Ethiopian restaurants can't hold a candle to those in other places like Washington DC they're still pretty decent and it's hard to argue against Ethiopian food in general. However, none of the local restaurants are very near me so I have to either drive in traffic or make it myself. 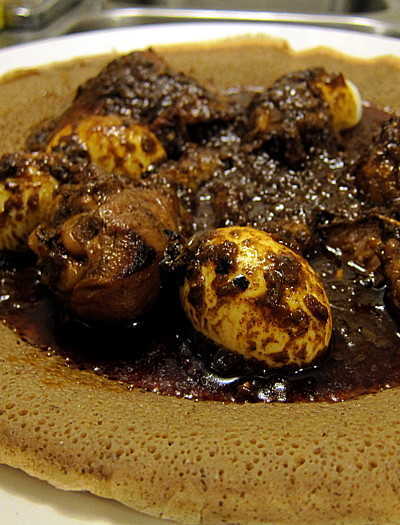 I can get Injera bread from Amy's Mercato in Seattle and I can get Berber spices as several African grocery stores.. Check out the recipe at doro_wat recipe.